Anthony Watts has posted an article by Steven Capozzola, who seems to be presenting himself as some sort of authority on hurricanes or climate (archived here, latest here). I checked him out. Is he any kind of expert on tropical cyclones? No. Has he even the most basic understanding of climate? No. Yet he pits himself against experts as if he knows something they don't. Steven Capozzola claims to be "Media consultant. CEO of CAP Media LLC. Advocate for U.S. manufacturing & affordable power" - not affordable, but expensive and dirty power. He's a denier for hire. The New York Times ran an op-ed today by Adam Sobel, an “atmospheric scientist at Columbia.” The gist of Sobel’s article: Since 2005, the United States has been experiencing a hurricane “drought” (I.e. no major hurricane has made landfall in the time. We are currently at 3918 days, over a decade.) But don’t worry, Sobel says, there will be more hurricanes soon, and the fact that they will be coming is proof of man-made climate change. The question is whether Sobel is writing the op-ed to buck himself up, and the rest of the alarmist crowd. No, that wasn't exactly what Adam Sobel was saying, as you've probably guessed. It’s somewhat baffling that the New York Times would publish such an essentially meaningless opinion. No, it's not a meaningless opinion, nor is it baffling. Adam Sobel's field of interest is atmospheric and climate dynamics, tropical meteorology. He got his PhD at MIT and has 297 publications listed in Google Scholar. Why would Steven Capozzola portray his expert opinion as "meaningless"? Why would he call the op-ed "an essentially meaningless opinion"? Well I'd say it was to justify his misrepresenting it. 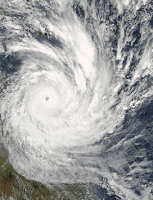 With global warming, hurricanes are expected to be stronger in the future. The best science predicts fewer hurricanes, but there is an amount of uncertainty in this prediction. The very strongest storms in the future will probably exceed any of the past in intensity. Only a little over 10% of the planets tropical cyclones occur in the Atlantic Ocean, which isn't a good representative of tropical cyclones all over the world. There is large natural variability in the Atlantic and elsewhere when it comes to tropical cyclones. Some hurricane seasons are active and some are not. This natural variability can occur not just year-to-year but even decade to decade and longer. The current US hurricane drought, that is, few hurricanes have made landfall in the USA recently, is "dumb luck" and won't last forever. Human activities have increased atmospheric concentrations of greenhouse gases and they have also increased the concentration of aerosols. Aerosol cooling appears to be disproportionately effective in reducing hurricane intensity. Climate models indicate that it's because of the increase in aerosols that globally hurricane intensity hasn't increased a lot as yet. Aerosol concentrations are plateauing at the global level. Even though they are still increasing in Asia, it is unlikely that this will keep pace with the rise in greenhouse gas emissions. In any case aerosols wash out of the air easily in a matter of weeks, while carbon dioxide stays in the air for a very long time. In other words, global warming will fuel more powerful and destructive storms in future. We first review projections of future TC [tropical cyclone] activity, considering not only intensity but other measures including TC frequency (the number of storms per year), TC-induced precipitation, and coastal flooding. Future projections underpin any discussion of human influence in the present. The influence of greenhouse gas emissions is expected to be greater in the future, and the literature regarding the mechanisms of that influence focuses more on future scenarios. We then discuss recent historical trends in both TC activity and potential intensity (PI), an environmental parameter that encapsulates much of our theoretical understanding of the control that climate exerts on TC intensity. PI is a useful parameter for understanding TC intensity as a function of the large-scale environment. It has multiple formulations that differ in detail but are broadly similar; here we use the formulation of Bister and Emanuel (11). The PI is a function of both the sea surface temperature (SST) and the vertical profiles of temperature and humidity in the atmosphere above. ...PI essentially measures the degree of disequilibrium between the ocean surface and the atmosphere; a warmer ocean or a cooler atmosphere (in an appropriately generalized sense, accounting for temperature, humidity, and vertical structure from the surface to the lower stratosphere) leads to greater PI. PI is a measure of the maximum intensity of a tropical cyclone in a given environment. The authors explained that climate models generally predict greater PI around the world, except for the eastern part of the North Atlantic. In other words, the maximum intensity of tropical cyclones is expected to increase as the world warms. However, they further explain that there are a variety of negative influences that prevent a cyclone from reaching its maximum theoretical intensity. These include "vertical wind shear and entrainment of dry air into the storm or ocean coupling". Altogether, the projection that TC frequency will decrease with warming is considerably more uncertain than the projection that TC intensity will increase. On the other hand, it's virtually certain that precipitation from tropical cyclones and coastal flooding will increase. So far, the warming effects of greenhouse gases on tropical cyclones have been masked, in part by air pollution. Over the past century, tiny airborne particles called aerosols, which cool the climate by absorbing and reflecting sunlight, largely cancelled out the effects of planet-warming greenhouse gas emissions when it came to tropical storm intensity, according to a new scientific review paper published this week in the journal Science. That might sound like a good thing, but many of those particles came from the burning of fossil fuels and wood, and contributed to acid rain, smog and lung damage. As vehicles and power plants added filters and scrubbers to reduce their impact on human health, levels of human-made aerosols in the atmosphere began to decline. At the same time, greenhouse gas concentrations continued to rise. That compensating effect won't continue if greenhouse gas warming keeps increasing, the scientists write. Using model simulations, they provide new calculations of the cancelling effects of aerosols and greenhouse gases on tropical cyclones worldwide. They also take a closer look at the still-developing understanding of how climate change will affect tropical cyclones, also known regionally as typhoons or hurricanes. "The fact that global warming's fingerprints don't yet jump out at us when we look at hurricanes isn't surprising -- it's what current science tells us we should expect," said lead author Adam Sobel, a professor at Columbia University's Lamont-Doherty Earth Observatory and School of Engineering. "The same science tells us that those fingerprints will show up eventually in more ultra-powerful storms." You can read the full press release here at ScienceDaily.com. ...Sobel says, there will be more hurricanes soon, and the fact that they will be coming is proof of man-made climate change. Even so, climate scientists like me believe that human-induced climate change will strengthen hurricanes and lead to worse disasters. The NY Times article is full of information, presented in a way that should be easy to understand even for people as ignorant about science as Steven Capozzola and Anthony Watts and his fans. They might have more trouble with the Science paper, but that's only because their brains shut down when confronted with science. Ironically, solar advocates can offer a valid hypothesis— since solar activity is now falling off—with a consequent leveling off of temperatures. Equally significant is that atmospheric CO2 has reached 400 parts per million (0.04%), and is essentially “saturated.” Thus, its greenhouse potential is maxed out, making additional heat-trapping less likely. Just who is being alarmist? I was mildly excited to read Sobel’s article this morning. I keep tabs on the NY Times because it is useful to keep track of what the elite wants us to think at any given time. Climate Science has drifted into a sort of religious orthodoxy in which the heretics must be constantly hectored with the evils of their ways. It would be sad if it were not so monstrously harmful to the majority of the citizens of this planet. The banality of Sobel and the left takes the breath away. Their conclusions are similar to the belief in the power of witches in Salem those many years ago. Mark - Helsinki broke the irony meter. Not only did he not read the op-ed or the Science paper, he's shown in the past that he discards all climate science because it is contrary to his "belief". (He's an ice age comether.) The scientists didn't reject any results. They wrote about them equally. Their research was to explain what has been observed. Sobel works towards an end, to find a link. As such any results that are to the contrary will be discarded. Hmm. I think Adam Sobal is an embarrassment to meteorologists everywhere. What he basically states is that your forecast can be wrong, day after day, but it doesn’t count on your skill-score, because being wrong is “dumb luck.” Then, when after ten years, you finally get a forecast right, your skill-score is 100%. On any Sunday, one can walk into a place of religious worship and hear a faith-based sermon. Similarly, the NYT regularly carries a faith-based sermon for its Progressive readers concerning their Climate Change religion. Curious George didn't bother checking what Steven Capozzola wrote against what Adam Sobel wrote. Just another fake sceptic. “the fact that [more hurricanes] will be coming is proof of man-made climate change” is incorrect both logically and grammatically. A reference to a hypothesized future event does not prove anything, except an author’s immaturity. Larry Hamlin is another fake sceptic from illiterati-land who rejects science out of hand. This New York Times editorial reflects the usual distortion, deception, ignorance. arrogance and incompetence that always accompanies and underlies climate alarmism claims. With all the deniers who think that climate change is natural, and weather is random, you't think they'd accept that natural variability exists. But CaligulaJones doesn't. Anyone who uses the word luck in regard to nature has automatically disqualified himself from speaking about science. “But don’t worry, Sobel says, there will be more hurricanes soon, and the fact that they will be coming is proof of man-made climate change. So a prediction that hasn’t even happened yet is “proof” of climate change? Does Sobel realize how ridiculous that is? It’s akin to saying, “The end of the world is nigh, and the fact that it is coming is proof that the Bible is true. Until it actually happens, it’s not proof of anything. Typical of WUWT - they are a pack of disinformers and wilful deniers, wanting so hard to believe that climate science is a hoax. Never forget that this "drought" depends on declassifying "Sandy", the worst storm to hit the New York area in decades, responsible for a thousand deaths and vast destruction, so it is not considered a land falling hurricane. It was certainly a major hurricane out at sea. And we have had numerous tropical storms with significant damage in recent years - not hurricanes due to slower wind speeds, but still highly damaging from their rainfall and wind effects (a tree fell on our house during "Irene" in 2011). Sou writes, "What Steven didn't let on was that Adam Sobel is the lead author of a new paper in Science, which the op-ed linked to and which is what the op-ed was all about." But this doesn't matter. Had Stevie mentioned the article in Science, it would just have produced a lot of feigned outrage about so-called "pal review". Aerosols are, IMO, saving our bacon regards AGW at the moment, but at a non-negligible cost. For one there's the viability of the air in places like Indonesia and China. For another, it masks the overall AGW problem by considerably offsetting the anthropogenic contribution. It's really the only reason people like Nic Lewis get a foot in the door. There is a whole cascade of hurricanes in the eastern Pacific (see Wunderground) at the moment. Atlantic storms, if they come this year, will likely begin in August or later. Republicans should be careful what they wish for; Sandy affected the election in 2012. It followed Irene and a rare October blizzard, which also did a lot of damage. I remember it well, because at the time I was taking care of my elderly parents (one on life support) and we were in the outer path of both storms. Many neighbors were without power for two to four weeks. Meanwhile, not making landfall isn't so great, as all too often that means transporting heat to the Arctic, which sure as heck doesn't need that now. Hurricane Irene and "Snowtober" (leaves still on trees so weight brought them down, I drove across Connecticut: mile after mile of hundreds and thousands of downed trees) were in 2011. I was lucky to survive, to be honest. "Ironically, solar advocates can offer a valid hypothesis— since solar activity is now falling off—with a consequent leveling off of temperatures." Steven must not be up to date regarding the two going on three years of record setting global temperature records. So this PR hack claims ENSO is driven by solar activity. Brilliant. That is up there with the claim, pushed by Plimer, about mid-ocean ridge activity driving ENSO. SOT, but have people seen this? MediaWatch chews out Murdoch's Australian for endorsing Jim Steele's marginal ramblings rather than actual, um, reef science. Good chance hurricane season '16 will detonate.